(Abbreviated) Section 1. Interactions between Soil Microflora and Fauna (G.J. Bollen, P. Bonants, L. Brussard, J. Coosemans, E. den Belder, J. de Haan, A.M. Dewar, A. El Titi, M. Geurs, T.W. Hofman, B.R. Kerry, H. Larsson, J. Middelkoop, J. Postma, W. Powell, R. Segers, S. Stemerding, L. Thijssen, J. van Esch, J.A. van Veen, G.H. Winder, B. Ulber, F.C. Zoon). Section 2. Transmission of Viruses by Soil Organisms. (M.F.J. Alderlieste, C.J. Asjes, L. Bos, D.J.F. Brown, A. de Heij, B. Henken, N. Huijberts, H. Maraite, H. Paul, A.T. Ploeg, A.Th.B. Rast, C. Rubies-Autonell, D.L. Trudgill, G. Tuitert, V. Vallega). Section 3. Fungal Antagonism. (C. Alabouvette, R.E. Beale, N. Cavalier, Y. Couteaudier, I.C. Danielsen, S. Deligianni-Mappa, R.T.V. Fox, R. Geremia, B. Gerhardson, M. Gerlagh, G.H. Goldman, H. Herrera-Estrella, G. Jager, J. Köhl, J.G. Lamers, M. Larsson, D. Looijen, E. Lucas, A.M. McQue, A. Mulder, J.J.W. Obanya Obore, P. Poupard, H. Rattink, J. Roosjen, E. Schlösser, F. Schönbeck, D. Spiegel, N.A.M. Steekelenburg, J.B. Sweet, J.E. Thomas, L.J. Turkensteen, K. Tzavella-Klonari, M. van Montagu, H. Velvis, J.W. Veenbaas-Rijks, I. Vos, J.M. Whipps, H. Wolffhechel). Section 4. Bacterial Antagonism (C. Alabouvette, P.A.H.M. Bakker, N.A. Baldwin, H. Bochow, A.L. Capper, G. Cartia, G. Cirvilleri, P. Debras, A. Dutrecq, M. Etienne, M.L. Lahdenpera, S. LeLarge, Ph. Lemanceau, P. Lucas, Ph. Lucas, M. Marlier, J.W. Meijer, U. Obieglo, A. Sarniguet, B. Schippers, E. Simon, J. Stevaux, J. Uoti, R. van Peer, E.A. Weststeijn, D.J. Yarham). Section 5. Crop-Induced and Site-Specific Antagonism (M. Babkiewicz, A. Bakker, G. Défago, G. Dijst, D. Elgersma, J. Fuchs, A. Garibaldi, L. Guglielmone, M.L. Gullino, D. Haas, G. Kahr, T. Kazimierczak, C. Keel, B.A.M. Kroon, H. Kwasna, K. Manka, A. Matta, M. Maurhofer, Q. Migheli, C. Minucci, T. Oberhänsli, P. Oyarzun, W.L.M. Punte, F. Rouxel, R.J. Scheffer, B. Schippers, G. Tamietti, C. Voisard). Section 6. Fate of Natural and Manipulated Antagonism (P.A.H.M. Bakker, G.R. Dixon, D.C.M. Glandorf, D. Funck Jensen, J.P.F.G. Helsper, W.P.M. Hoekstra, M. Leeman, B. Metzler, W.L.M. Punte, J.M. Raaijmakers, E. Salentijn, B. Schippers, L. Sundheim, E.C. Tjamos, A. van Norel, R. van Peer, H. Wolffhechel). Section 7. 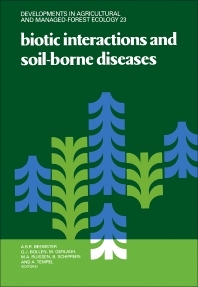 Other Aspects of Soil-Borne Diseases (D. Amelung, J.P. Clarkson, J. Dahl Møller, A.R. Entwhistle, D. Funck Jensen, L. Lange, J. Larsen, A. Mead, H.L. Munasinghe, L.W. Olson, H. Schüepp, E. Wester). Section 8. Biocontrol and Agricultural Practice (K.A. Powell). This volume contains a collection of all the papers presented at the founding conference of the European Foundation for Plant Pathology, held from 26th February to 2nd March 1990 at Wageningen, The Netherlands. It focusses on the theme of "Biotic Interactions and Soil-Borne Diseases", on which there are contributions from leading European scientists in the field of soil-borne diseases. Ways of exploiting biotic processes and phenomena which result in plant production harmless to the environment are explored.